Mid-century modern homes of all sorts will be a topic of conversation at the Expo. 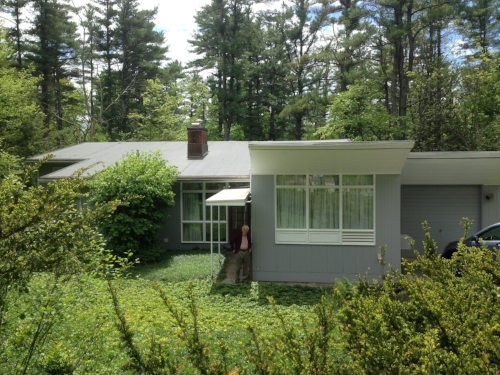 This David Campbell designed house in Durham was built in the early 1950s for Mary and Edwin Scheier, famous potters who taught at UNH. Courtesy: Peter Michaud. Life can be relaxing and enjoyable on the porch or in the garden, right? Presenters Gillian Lang and Henry Homeyer – and exhibitors – will offer historical perspectives and advice on these important, hip parts of homes we love. Talk to folks from Pope Memorial SPCA Concord - Merrimack about their Barn Cat Program. Pope Memorial SPCA Concord-Merrimack County will be at the show to inform attendees about barn cat adoption and care. The Preservation Alliance’s members who are barn and barn cat owners report that their daily routine of barn cat care helps them keep track of barn maintenance issues. The cats also help control rodent population, and are fun to have around. Learn about the evolution of timber frames in New England from Jim DeStefano, structural engineer, architect and author of Antique New England Homes and Barns and buy a chance to win a timber frame shed assembled at the show by members of the Timber Framers Guild. Share your thoughts at the March 24-25 Expo and with a note to projects@nhpreservation.org.